The cost of college tuition in the United States increased by over 300% since 1980, making it much more costly to obtain a higher education. 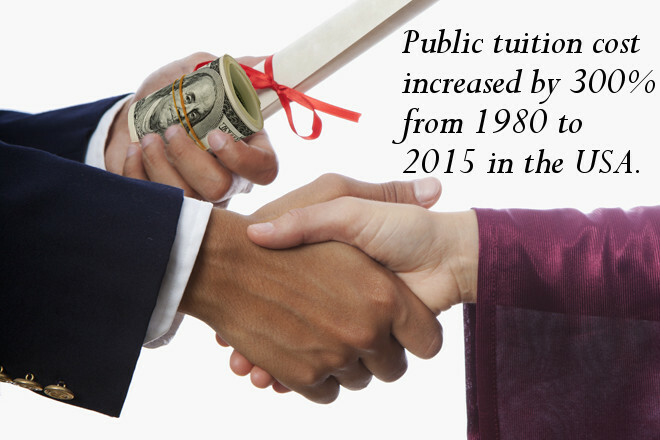 In 1980, the cost of a Public Four-Year college tuition cost $2,320 USD annually (adjusted for inflation to 2015 dollars) and rose to an annual rate of $9,410 USD in 2015, which is an increase of 305.60%. This large increase has resulted in the majority of college graduates having large student loan debt that they will spend many years of their lives paying off. It is this financial burden that is affecting future generations ability to obtain highly technical jobs, but also has given rise to outsiders in the political sphere. Such an outsider is Bernie Sanders, who has proposed a plan for free public college tuition for all students. But even though he lost out the Democratic Party's nomination to Hillary Clinton, his strong views on education is forcing both parties, including the Republican Party and Donald Trump, to focus on more on education because it resonantes with students. And as we all know, politicans want votes above all else so hopefully students become more engaged in politics and force the ruling party to ensure their voices are heard!